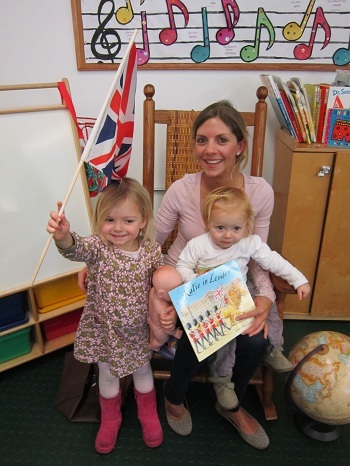 "Grandma in England loved the pictures on the website and the blog! 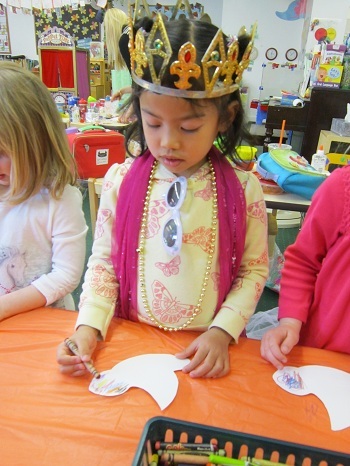 She said that preschool looks like such fun that she wants to come!" 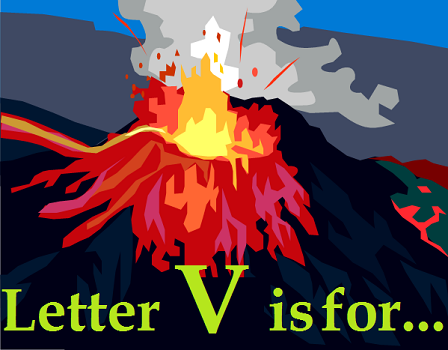 APRIL SCHOOL TOUR - 11:00 a.m.
“Letter V is for Volcano Week” is Next! “Letter U is for Up (in the sky) Week” was utterly unbelievable, unimaginably unique and uber-uplifting! Read on below to learn about the fun that was had and learning that took place! Although the letter U is not the most common letter in the alphabet, the students managed to fill the sharebox each day throughout the week! Only a few of the shares actually started with the letter U while most of them related to the Up in the sky theme! Take a peek at this Umbrella that one student brought in! The students spent Monday and Tuesday morning completing their letter U activities and morning work! 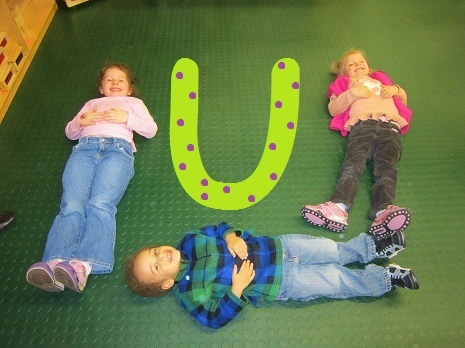 During both Monday and Tuesday afternoon, the students created a Letter U list and went hunting around the classroom for any U in sight! Despite the confusion early on with word suggestions like “You starts with U”, the students were able to come up with a lot of great U words! Things even got a bit silly as the students transformed into U’s themselves! Also during the afternoon on Monday, a PPA Mommy came in to be a Guest Reader for the students! The Mommy photographed below lives in the United States now but grew up in different letter U location – the United Kingdom (England). The student loved learning about the United Kingdom and hearing a story about a little girl named Kate who lives in London! They were particularly excited to learn that they would be tasting a sweet (and delicious) treat from the U.K. as well! A special PPA “Thank You” to this Mommy for coming in and spending the afternoon with us! We hope you had as much fun as we did! 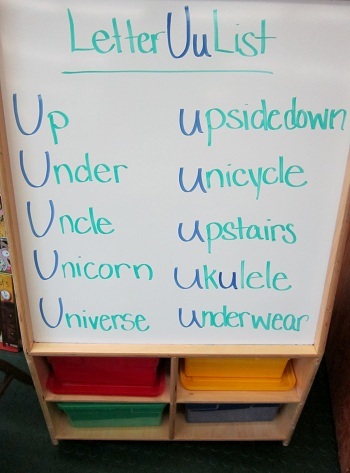 Wednesday morning was spent discussing the letter U theme of the week – Up in the sky! 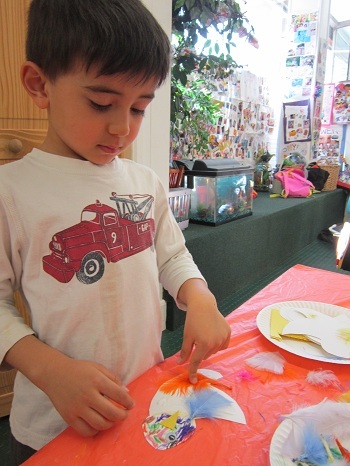 For their art project, the students created a feathery friend that can be found Up in the sky – can you guess what the students made? If you said, “A bird!” then you are correct! 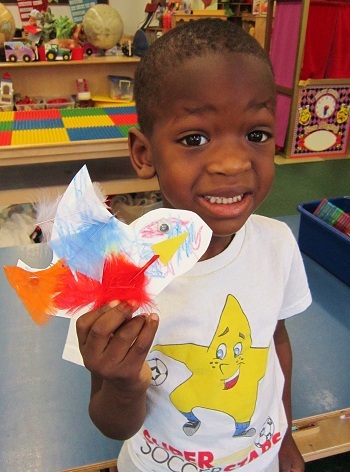 Take a look below to see how the students created their beautiful birds! During the afternoon, the investigation into the question began! Websites including National Geographic Kids proved to be very informative! The students looked at several upclose photographs of bird bodies – particularly the wings and legs. It was noted that each bird had rather long wings relative to the rest of its body. The students were suprised to learn that birds, like people, have a pair of legs. 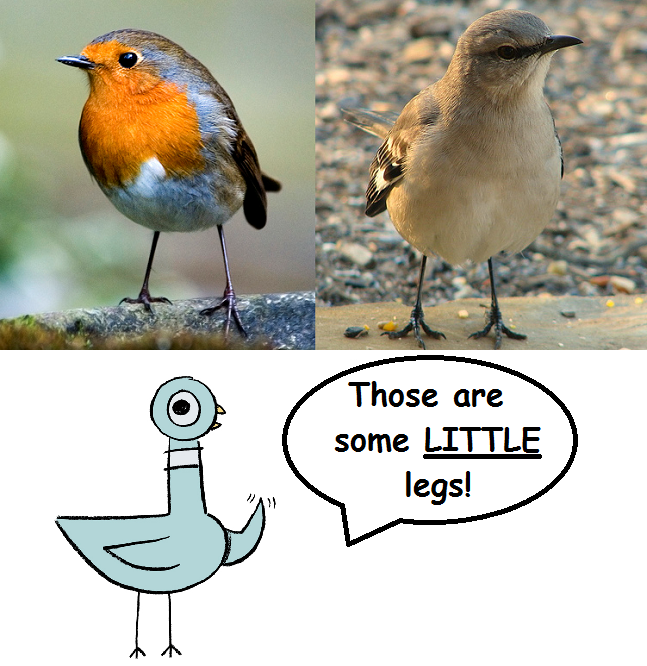 Unlike legs on a humans, bird legs are quite little and weak. After looking at the following photograph it was concluded that birds would need to take A LOT of steps to get around on foot! Thankfully the wings of a bird help it lift up off of the ground and soar through the sky! The students were so excited to view images of all different species of birds and see them soaring in the air. They also enjoyed learning about the V formation that geese fly in! Take a look for yourself below. It is much more impressive than you might expect! While the authentic photographs and footage was a big hit amongst the students, it was clear that the following animated clip was the favorite of the day! Enjoy an animated version of the PPA favorite below but REMEMBER, DON’T LET THE PIGEON DRIVE THE BUS! 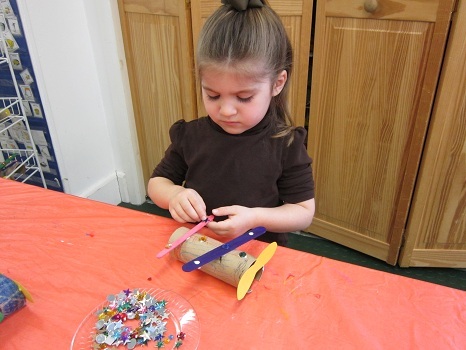 On Thursday the students began discussing a different winged “Up in the sky” topic – Airplanes! 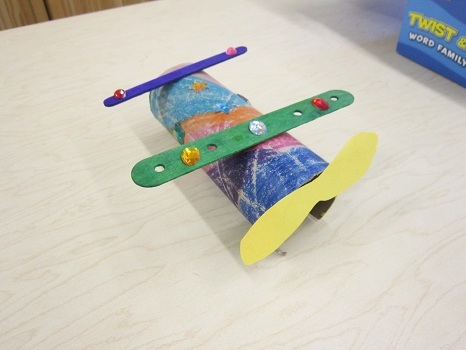 For their morning work, the students transformed a paper towel roll into a realistic looking airplane! Here is how they did it! 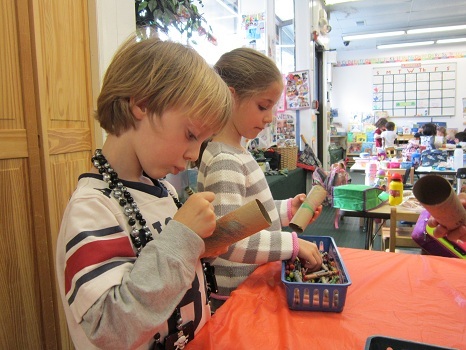 On Thursday and Friday afternoon, the students began a new unit in Spanish class called Los Animales (Animals). With some help from the returning students, the Animale vocabulary from last year was reviewed. Here are the words that the students reviewed/learned this week. Afterward, they practiced singing the following song. Lots of Animals – Oh wow! Also on Thursday the students were paid a visit by special guest! The student pictured below is not only the big brother of a current PPA student; he was once a student at PPA himself! 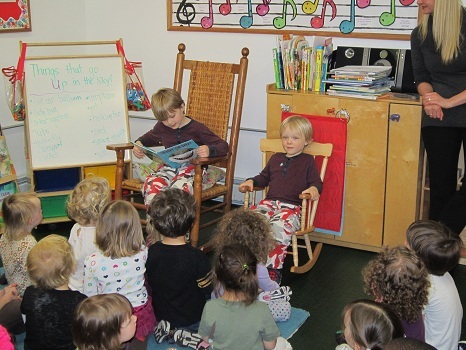 The student, now in first grade, returned to PPA to read a story to his brother and his classmates! What an exciting visit it was! 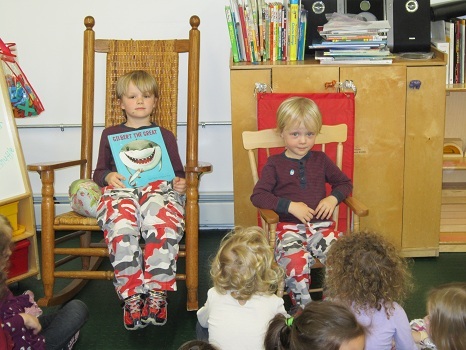 A special PPA thank you to PPA’s guest reader! You did such a great job! In the morning on Friday, the students completed another Up in the air craft! This time it was a bit different because it was a free-draw! 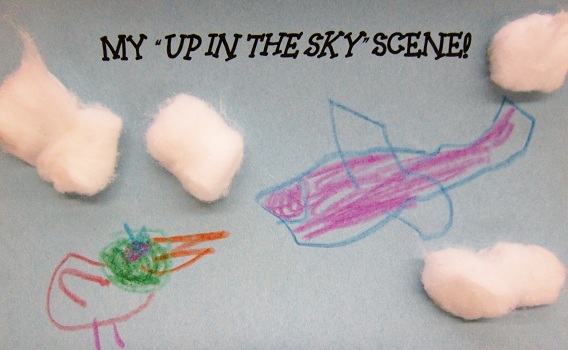 Given sky blue paper and some cotton balls for clouds, the students added their own illustrations of various Up in the sky items! Take a peek at one of the illustrations to see what great detail went into these art projects! The students wrapped up Friday with a Spanish lesson all about their new (and most exciting one yet) unit – Los Animales (Animals) – see above. Well, that is all for “Letter U is for Up (in the sky) Week”. As always, thank you for reading! Have a fun and safe weekend! SCHOOL IS CLOSED NEXT WEEK! 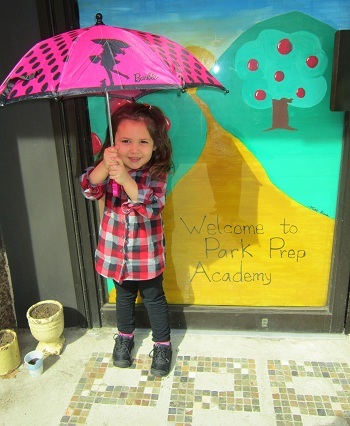 © Copyright 2019 Park Prep Academy Private Preschool of New Jersey. All rights reserved.